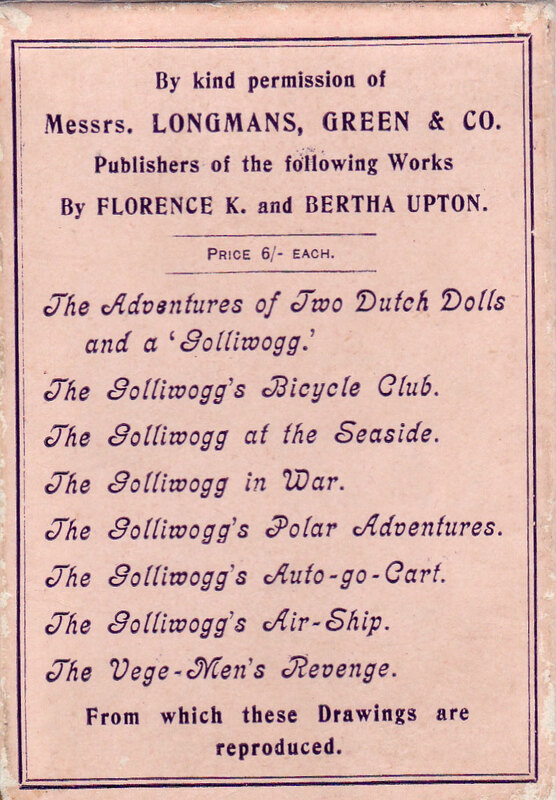 The late Victorian stories about the Golliwogg and the Dutch Dolls (cheap German-made dolls known as Dutch dolls from a corruption of “Deutsch”) were written by Bertha Upton (1849-1912). Her daughter Florence Kate Upton (1873-1922) illustrated her mother’s books with the charming pictures which made them so popular. The books are highly collectable today, even though they have more recently been deemed offensive and inappropriate for children¹, and can fetch very high prices. 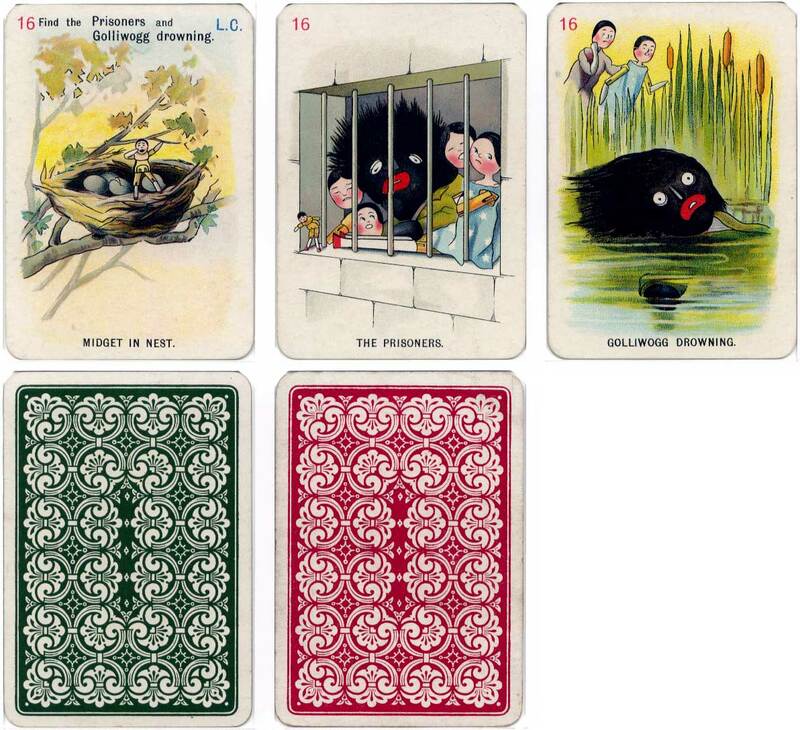 The same applies to the historical De la Rue card game which is based on the first seven Golliwogg books as shown on the rear of the box. 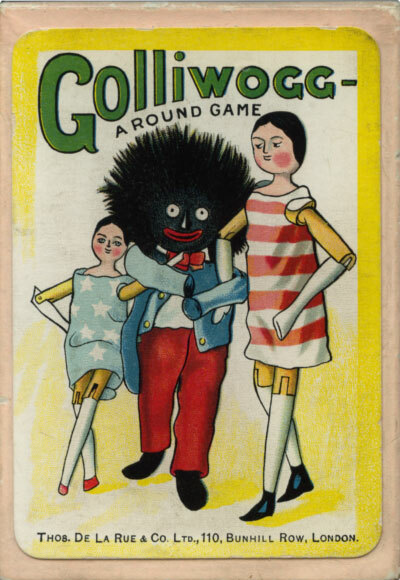 This is a great aid to dating the card game because it confirms that it appeared before “The Golliwogg’s Circus” in 1903. The only other book that the Uptons published was called “The Vege-Men’s Revenge” published in 1897 but it never was as big a seller as the Golliwogg series. 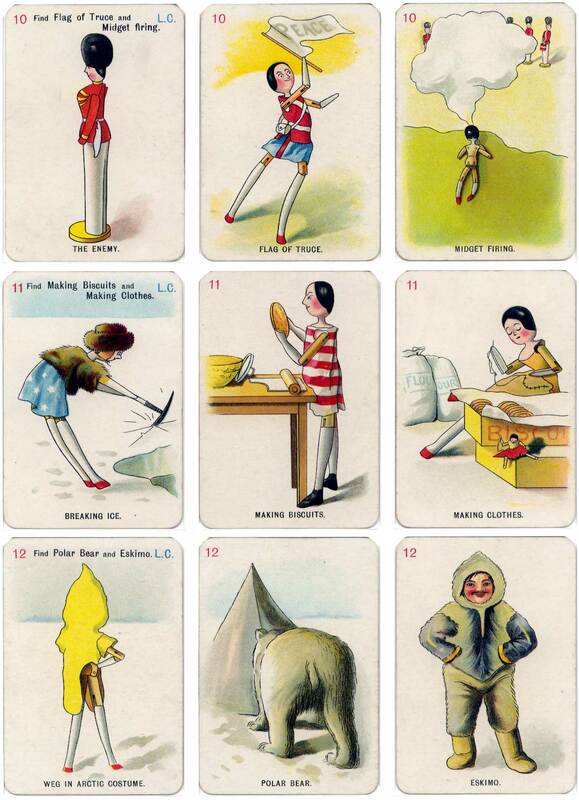 Above: selection of cards from the “Golliwogg” card game illustrated by Florence Kate Upton (1873-1922) and published by Thos de la Rue & Co Ltd by arrangement with Messrs Longmans, Green & Co, c.1902. Images and notes courtesy Rex Pitts. ¹ NOTE The black faced doll came out of the American tradition of black faced minstrels (which began around 1830) in which white men and a few black men wore intense black make up and sang songs in a fake Southern accent. When it came to the UK in the late 19th century it was very popular in the Music Halls and special Minstrel shows. The extremely popular children’s book “Little Black Sambo” was published in 1899 and was still on sale in the 1940s. Agatha Christie wrote “Ten Little Niggers” in 1939. Although the title was revised much later the stage adaptation was first performed in London entitled “Ten Little Niggers” later to become “Ten Little Indians” and finally “And then there were None”. In the 1927 film “The Jazz Singer”, the first talkie, Al Jolson appeared blacked up to sing some of the songs as he had been doing on the stage for years. Jolson himself, being a Jew, knew racial prejudice well and, ironically, campaigned against black prejudice. The Uptons who wrote the Golliwogg books had migrated to the USA and this may be the reason behind the stories where black faced dolls were commonplace. Many children had a golliwog doll but we know better now!